i have been eyeballing jim lahey‘s homemde spicy mustard for the longest time. i have never really “discovered” mustard till i had my first subway sandwich. since then, i was addicted to it. i love that spicy taste with cold meat or fried food. while people go for tartar sauce for their fish and chips, i opt for mustard instead. thus the chance to make my own mustard was too good to pass on. seriously the recipe is dead simple. the difficult bit – finding mustard seed. i went to most supermarkets in singapore – no one carries mustard seeds (some actually have juniper berries. huh?!). i almost resort to going to mustafa and hunt for it. on a kaypoh and lotsa of time to kill moment, i found them in chinatown food centre. this wonderful man called anthony had a wonderful tiny sterile looking stall that carries all sorts of spices and dried herbs. i was about to whizz pass his stall, till i saw packets of mustard seeds hanging on the hook. in my stubby brain, i was like I HIT THE JACKPOT! by the way, anthony is a very friendly chap – he even asked what i am going to do with the mustard seeds. from the look of his face, i think i might be the first to use it for making mustard. ok this is the first time i am sharing recipe with you peeps because i really loving this mustard. once you tatste it, you just dont want to use store bought mustard. the taste is stronger and its purer in flavor. the only disadvantage, it lasts only a month (in the fridge). - put the mustard seeds in a small bowl and cover with ¼ cup of the spring water. 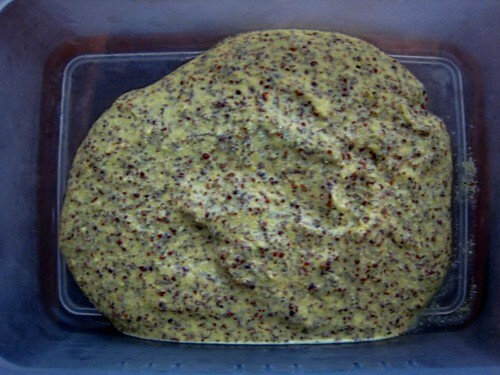 let it soak overnight in the fridge (i used a tupperware that comes with a cover; easier and you dont have to worry that it will topple) (FYI when you open the cover the next day, you will realise that the mustard seeds have soaked up most of the liquid). - drain any liquid from the mustard seeds and place them in a blender (i used an immersion blender; i dont think it will work in food processor due to the size of the seeds and blade). add the vinegar, salt and the remaining ¼ cup of water and puree until a paste forms; the mustard will be grainy. add more water by tablespoon if the mustard is too thick. - i also added ¼ teaspoon of brown sugar. this was NOT stated in the recipe. 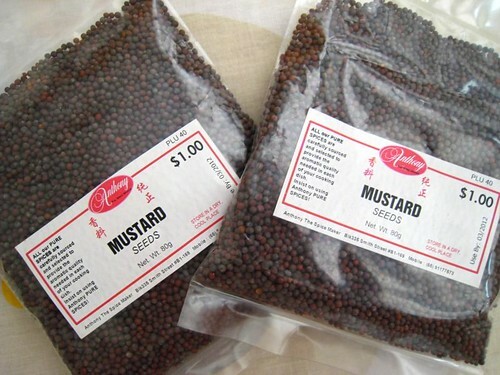 there are many different type of mustard seeds. the ones i got are spicer and leaves a bit of bitter aftertaste. to soften the bitterness, i added brown sugar. you can also try honey but do note that honey is also a flavoring thus it might affect the taste of the mustard – you might end up getting honey mustard. - use the mustard immediately or cover and store in the fridge.